امانی, ناصر, باقرزاده ولمی, هادی. (1397). ارزیابی کارایی شرکت های برق منطقه ای ایران با تحلیل پوششی داده های شبکه ای: بر اساس تبدیل ساختار‌ها به یک ساختار یکنواخت. تصمیم گیری و تحقیق در عملیات, 3(3), 249-280. ناصر امانی; هادی باقرزاده ولمی. "ارزیابی کارایی شرکت های برق منطقه ای ایران با تحلیل پوششی داده های شبکه ای: بر اساس تبدیل ساختار‌ها به یک ساختار یکنواخت". تصمیم گیری و تحقیق در عملیات, 3, 3, 1397, 249-280. امانی, ناصر, باقرزاده ولمی, هادی. (1397). 'ارزیابی کارایی شرکت های برق منطقه ای ایران با تحلیل پوششی داده های شبکه ای: بر اساس تبدیل ساختار‌ها به یک ساختار یکنواخت', تصمیم گیری و تحقیق در عملیات, 3(3), pp. 249-280. امانی, ناصر, باقرزاده ولمی, هادی. ارزیابی کارایی شرکت های برق منطقه ای ایران با تحلیل پوششی داده های شبکه ای: بر اساس تبدیل ساختار‌ها به یک ساختار یکنواخت. تصمیم گیری و تحقیق در عملیات, 1397; 3(3): 249-280. دانشکده علوم پایه، گروه ریاضی کاربردی، دانشگاه آزاد اسلامی، واحد یادگار امام (ره) شهر ری، تهران، ایران. تحلیل پوششی داده‌ها (DEA)، یک روش مبتنی بر برنامه‌ریزی خطی برای اندازه‌گیری کارایی واحدهای تصمیم‌گیری در علم اقتصاد است. در مدل‌های کلاسیک DEA برای محاسبه کارایی یک سیستم معمولا کل سیستم را به‌ عنوان یک واحد تصمیم‌گیری (DMU) در نظر گرفته و ارتباطات فرآیند‌های جداگانه درون سیستم را نادیده می‌گیرند؛ حال آنکه ارتباطات درونی بخش‌های مختلف یکDMU می‌توانند دارای ساختار‌های متنوعی باشند که موجب پیچیدگی در ارزیابی کارایی آن گردند. دیدگاه شبکه‌ای از جمله راهکارهای مناسب برای مدل‌سازی ارتباطات درونی واحد‌هاست که این ارتباطات زیرواحد‌ها در یک DMU ممکن است به صورت سری یا موازی یا مختلط باشند. هدف این مقاله معرفی ساختاری جدید به نام ساختار ستاره‌ای در تحلیل پوششی داده‌های شبکه‌ای است که به ‌راحتی بتوان ضمن حفظ استقلال میان شاخص‌ها، هر ساختاری که بین زیر‌واحدهای یک DMU وجود دارد را به چنین ساختاری جهت ارائه ارزیابی دقیق‌تری از کارایی یک DMU تبدیل نمود. در ادامه این مقاله با استفاده از ساختار ستاره‌ای، عملکرد شرکت‌های برق منطقه‌ای در ایران مورد ارزیابی قرار می‌گیرد. Department of Applied Mathematics, Islamic Azad University, Yadegar-e-Imam Khomeini (RAH) Shahre Rey Branch, Tehran, Iran. Data Envelopment Analysis (DEA) is a method based on linear programming to measure efficiency of Decision Making Units (DMU). In classic models of DEA, the whole system had been usually considered as a Decision Making Units to evaluate respective efficiency and it is also ignored the separate processes inside the system. Whereas, the internal relations of various sectors of a Decision Making Unit can have had diverse structures which cause complexity in evaluating its efficiency, because, the type of structures and the performance of these components would have different effects on efficiency of the system. Network standpoint is one of the appropriate ways for the internal relations of units’ modeling and the relation among sub-units in a DMU may be communicated in series, parallel or mixed way. In this paper, a new convert called Star Structure was introduced as a comprehensive one. 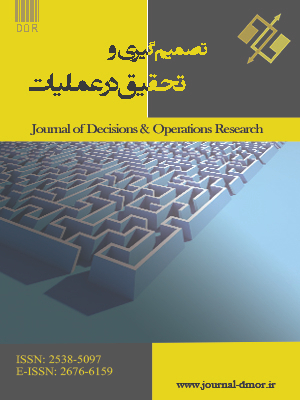 The one that every structure existing between a Decision Making Units’ sub-units can easily be converted to such structure so that can accurately evaluate a Decision Making Units’ efficiency and also using star structure, we evaluated the performance of regional electronic companies in Iran. Charnes, A., Cooper, W. W., & Rhodes, E. (1981). Evaluating program and managerial efficiency: an application of data envelopment analysis to program follow through. Management science, 27(6), 668-697. Chen, Y., Liang, L., Yang, F., & Zhu, J. (2006). Evaluation of information technology investment: a data envelopment analysis approach. Computers & operations research, 33(5), 1368-1379. Färe, R., & Grosskopf, S. (1997). Intertemporal production frontiers: with dynamic DEA. Journal of the operational research society, 48(6), 656-656. Fӓre, R. (1997). Efficiency and productivity in Rich and poor countries. In B. S. Jensen & K. Wong, (Eds. ), Dynamics, economic growth, and international trade (pp. 43-63). University of Michigan press. Fӓre, R., & Grosskopf, S. (2000). Network DEA. Socio-Economic planning sciences, 34, 35-49. Kao, C. (2009a). Efficiency measurement for parallel production systems. European journal of operational research, 196(3), 1107-1112. Kao, C. (2009b). Efficiency decomposition in network data envelopment analysis: A relational model. European journal of operational research, 192(3), 949-962. Kao, C. (2014). Efficiency decomposition for general multi-stage systems in data envelopment analysis. European journal of operational research, 232(1), 117-124. Kao, C., & Hwang, S. N. (2010). Efficiency measurement for network systems: IT impact on firm performance. Decision support systems, 48(3), 437-446. Keh, H. T., Chu, S., & Xu, J. (2006). Efficiency, effectiveness and productivity of marketing in services. European journal of operational research, 170(1), 265-276. Lewis, H. F., & Sexton, T. R. (2004). Network DEA: efficiency analysis of organizations with complex internal structure. Computers & operations research, 31(9), 1365-1410. Liang, L., Cook, W. D., & Zhu, J. (2008). DEA models for two‐stage processes: Game approach and efficiency decomposition. Naval research logistics (NRL), 55(7), 643-653. Liu, J. S., & Lu, W. M. (2012). Network-based method for ranking of efficient units in two-stage DEA models. Journal of the operational research society, 63(8), 1153-1164. Liu, J. S., & Lu, W. M. (2010). DEA and ranking with the network-based approach: a case of R&D performance. Omega, 38(6), 453-464. Lovell, C. A. K., Walters, L. C., & Wood, L. L. (1994). Stratified models of education production using modified DEA and regression analysis. In A. Charnes W. W. Copper A. Y. Lewin & L. M. Seiford (Eds. ), Data envelopment analysis: theory, methodology and applications (pp. 329-351). London: Kluwer Academic Publishers. Lozano, S. (2015). Alternative SBM model for network DEA. Computers & industrial engineering, 82, 33-40. Prieto, A. M., & Zofío, J. L. (2007). Network DEA efficiency in input–output models: with an application to OECD countries. European journal of operational research, 178(1), 292-304. Bernstein, M. A., Feldman, S. L., & Schinnar, A. P. (1990). Impact of pollution controls on the productivity of coal-fired power plants. Energy economics, 12(1), 11-17. Yaghobi, A. (2016). A detailed report on Iran’s electricity power industry, particularly management. Retrieved from Tehran: Ministry of Power of the Islamic Republic of Iran, Tavanir, Department of Human Resources and Research.